DIE Martis, videlicet, 5 die Julii. Money distributed to poor Irish. and with an Order to pay Mr. Loftus 10,000 l. for Ireland. Thanks to the Earl of Exeter, for his Contribution for raising Horse. Conference about the Intelligence from Hull reported. Town of Colchester and Freshfield. and with an Order for Lords Lieutenants and Deputy Lieutenants to assist one another. Order to prohibit the publishing of Proclamations, &c. against the Parliament. Examinations of Lord Magwire, &c.
Message to the H. C. that the Lords agree to Three Orders sent up. Letters about the Discharge of the Earl of Northumberland, from being Lord Admiral. To be returned to the H. C.
Message from the H. C. to impeach Sir Robert Gurney, Lord Mayor of London, of High Crimes and Misdemeanors. Letter from the Committee at Hull, to the Speaker of the H. C. about the Situation of that Place. Richards, Lord Dudley's Servant's Privilege. The Five Commanders in the Fleet will put themselves under the Earl of Warwick's Command, and desire the Parliament to indemnify them. Committee to prepare a Letter of Thanks to the Earl of Warwick. The Letter to the Earl of Warwick. L. Cromewell Leave to go to Ireland. Message from the H. C. that they may communicate some Letters from Hull, and Propositions about the Safety of the Kingdom. The Letter of Thanks to the E. of Exeter. E. of Warwick's Letter to Mr. Pym. "From aboard His Majesty's Ship The James, in The Downes, this 4th of July, 1642." Ordered, That the Clerk of the Crown shall pay unto Elianor Winter, a poor Irish Widow, Five Pounds, and to Ten poor Ministers of Ireland Five Pounds apiece. 1. To desire a Conference, concerning some Advertisements they have received from Hull, which concerns much the Safety of the Kingdom. 2. That the House of Commons do concur with their Lordships in the Amendments in the Instructions for Rutlandshire, with the Recommendation of Three new Deputy Lieutenants. 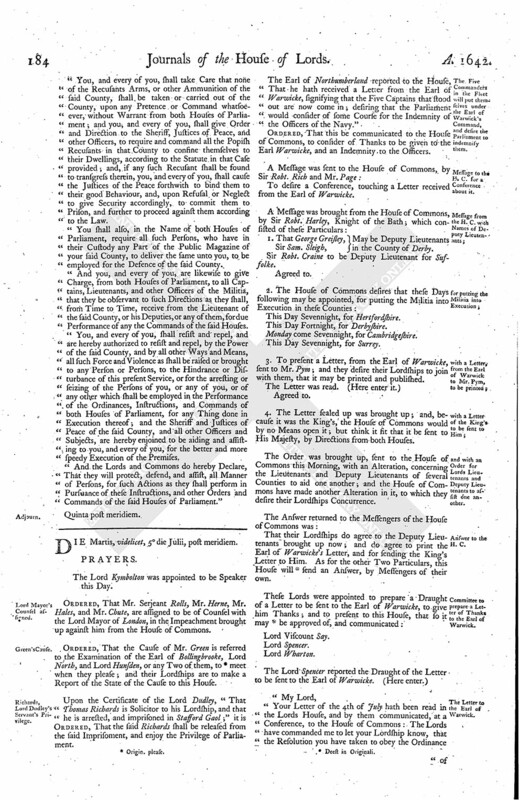 "It is this Day Ordered, by the Lords and Commons House of Parliament, That the Treasurers appointed to receive the Ten Thousand Pounds lent by the Companies of the City of London shall forthwith impress the Sum of Ten Thousand Pounds to Mr. Loftus, Deputy Treasurer at War for Ireland, to be disbursed by him to Mr. Frost, Commissary at Chester, for the Affairs of Ireland." That this House will give a present Meeting, in the Painted Chamber; and their Lordships do agree to the Three new Deputy Lieutenants for Rutlandshire, and the Order for Ten Thousand Pounds for Ireland. Ordered, That the Speaker of this House do write a Letter to the Earl of Exon, to give him Thanks for the Five Hundred Pounds, which his Lordship hath offered, for the raising of Horse, &c. and to send him the Instructions for Rutlandshire. Next, the Ordinance for the raising of Five Thousand Men and Five Hundred Horse for Ireland was read. Ordered, That this House agrees to this Ordinance; and that Tho. Ogle, Christopher Burgh, and Henry Skipwith, that were Yesterday excepted against, and conceived to be unfit Persons to be employed as Commanders, shall be here; and, if there appear to be just Cause hereafter to put them out, this House do therein according to Justice. 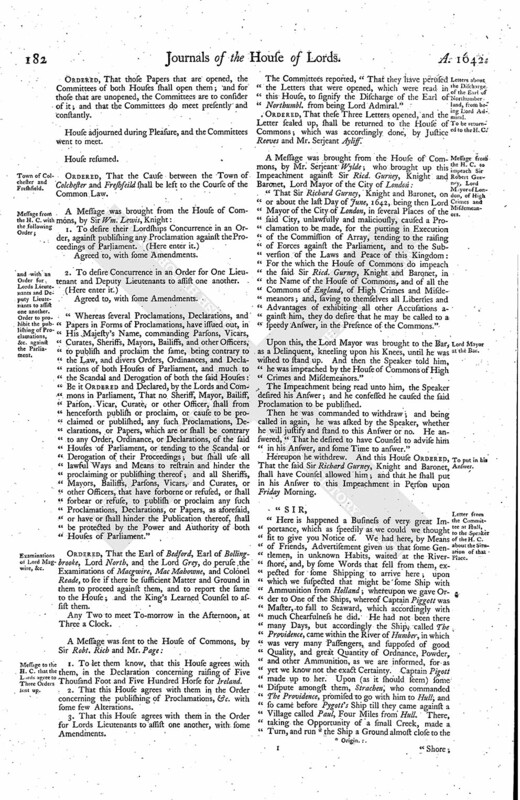 "Whereas the Forces of Horse and Foot, Voluntiers, which shall be sent over into Ireland by Force of an Act made this present Session of Parliament, intituled, "An Act for the speedy and effectual reducing of the Rebels in His Majesty's Kingdom of Ireland to their due Obedience to His Majesty and the Crown of England," may, by virtue of the said Act, be raised by the Directions of the Lords and Commons in Parliament assembled; it is therefore Ordered, by the said Lords and Commons, That additional Forces of Five Thousand Foot and Five Hundred Horse Soldiers, Voluntiers, besides Officers, shall and may be forthwith raised, for the aforesaid Expedition; and that, for the better effecting thereof, the several Officers of the Field and Captains hereafter named; videlicet, the Right Honourable Phillip Lord Wharton, Colonel General; Lord Kirry, Tho. Balard, Charles Essex, Wm. Bamfeild, Colonels; Jeremy Horton, Henry Shelley, Sir Edward Denny, Adam Cunningham, Joseph Wagstaff, Lieutenant Colonels; Owen Parry, Daniell Goodroeck, Francis Marten; Tho. Ogle, George Hutchingson, Serjeant Majors; Vincent Calmady, Charles Dawson, Edw. Primrose, Wm. Roberts, Jo. Bamfeild, Robert Longe, Herbert Blancher, Edw. Allen, George Marrow, Horatio Carey, and Henry Carew, Admondisham Muschamp, Francis Fouke, Constance Ferrer, Robt. Baker, Henry Skipwith, Paul Watts, Tho. Middleton, Sam. Loftus, Christopher Burgh, Elias Struice, Wm. Lower, Peter Murford, Jo. Jenkins, Ricd. Benson, Captains of Foot; and the said Right Honourable Phillip Lord Wharton, Colonel General; Lord Brogball, Sir Faithful Fortescue, Jo. Hurry, Alexand. Nayrne, John Trenchard, Wm. St. Leger, Captains of Horse Troops, and their several Lieutenants, Ensigns, and other Officers, shall and may have Liberty to beat up Drums in all Places within the Kingdom of England and Dominion of Wales, and thereby or otherwise to raise and levy so many Soldiers, Voluntiers, as shall suffice to make up unto every of the said Captains One complete Company; videlicet, every Colonel's Company One Hundred and Fourscore Men, every Lieutenant Colonel's Company One Hundred and Fifty Men, every Serjeant Major's Company One Hundred and Twenty Men, and every Private Company One Hundred and Ten Men; the Colonel General's Troop Eighty Horse, and every of the other Troop Seventy Horse: All which said several Companies of Horse and Foot make up the Number of Five Thousand Foot and Five Hundred Horse, besides Officers, to be employed in the aforesaid Service." "1. A Letter from the Committees, to give Notice that there is a Ship, called The Providence, come from Holland, with some Ammunition. "2. A Packet of Letters were presented which were from Mr. Ashburnham at Hull. "That the House of Commons desired that the Committee of Five, that were appointed Yesterday, may be appointed (fn. 1) to meet constantly and presently, and to consider of the Letters now brought up, which are sealed up." Ordered, That those Papers that are opened, the Committees of both Houses shall open them; and for those that are unopened, the Committees are to consider of it; and that the Committees do meet presently and constantly. House adjourned during Pleasure, and the Committees went to meet. Ordered, That the Cause between the Town of Colchester and Freshfeild shall be left to the Course of the Common Law. Agreed to, with some Amendments. 2. To desire Concurrence in an Order for One Lieutenant and Deputy Lieutenants to assist one another. 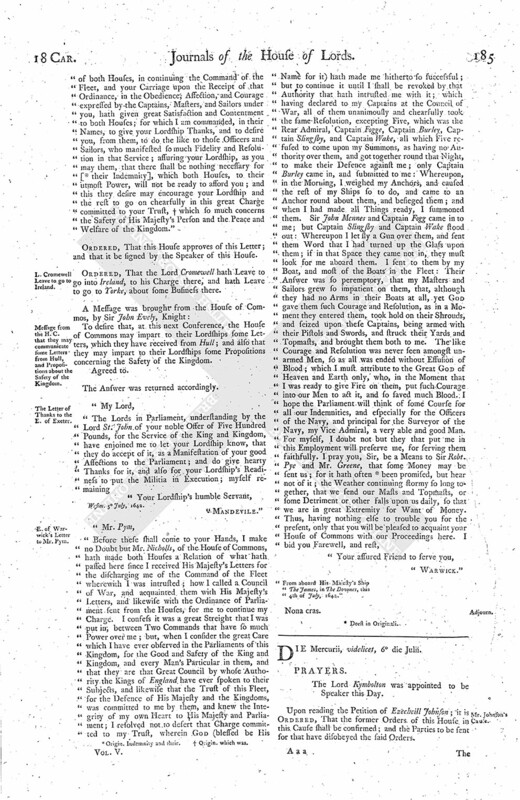 "Whereas several Proclamations, Declarations, and Papers in Forms of Proclamations, have issued out, in His Majesty's Name, commanding Parsons, Vicars, Curates, Sheriffs, Mayors, Bailiffs, and other Officers, to publish and proclaim the same, being contrary to the Law, and divers Orders, Ordinances, and Declarations of both Houses of Parliament, and much to the Scandal and Derogation of both the said Houses: Be it Ordered and Declared, by the Lords and Commons in Parliament, That no Sheriff, Mayor, Bailiff, Parson, Vicar, Curate, or other Officer, shall from henceforth publish or proclaim, or cause to be proclaimed or published, any such Proclamations, Declarations, or Papers, which are or shall be contrary to any Order, Ordinance, or Declarations, of the said Houses of Parliament, or tending to the Scandal or Derogation of their Proceedings; but shall use all lawful Ways and Means to restrain and hinder the proclaiming or publishing thereof; and all Sheriffs, Mayors, Bailiffs, Parsons, Vicars, and Curates, or other Officers, that have forborne or refused, or shall forbear or refuse, to publish or proclaim any such Proclamations, Declarations, or Papers, as aforesaid, or have or shall hinder the Publication thereof, shall be protected by the Power and Authority of both Houses of Parliament." Ordered, That the Earl of Bedford, Earl of Bollingbrooke, Lord North, and the Lord Grey, do peruse the Examinations of Macgwire, Mac Mabowne, and Colonel Reade, to see if there be sufficient Matter and Ground in them to proceed against them, and to report the same to the House; and the King's Learned Counsel to assist them. Any Two to meet To-morrow in the Afternoon, at Three a Clock. 1. To let them know, that this House agrees with them, in the Declaration concerning raising of Five Thousand Foot and Five Hundred Horse for Ireland. 2. That this House agrees with them in the Order concerning the publishing of Proclamations, &c. with some few Alterations. 3. That this House agrees with them in the Order for Lords Lieutenants to assist one another, with some Amendments. The Committees reported, "That they have perused the Letters that were opened, which were read in this House, to signify the Discharge of the Earl of Northumbl. from being Lord Admiral." Ordered, That these Three Letters opened, and the Letter sealed up, shall be returned to the House of Commons; which was accordingly done, by Justice Reeves and Mr. Serjeant Ayliff. "That Sir Richard Gurney, Knight and Baronet, on or about the last Day of June, 1642, being then Lord Mayor of the City of London, in several Places of the said City, unlawfully and maliciously, caused a Proclamation to be made, for the putting in Execution of the Commission of Array, tending to the raising of Forces against the Parliament, and to the Subversion of the Laws and Peace of this Kingdom: For the which the House of Commons do impeach the said Sir Ricd. Gurney, Knight and Baronet, in the Name of the House of Commons, and of all the Commons of England, of High Crimes and Misdemeanors; and, saving to themselves all Liberties and Advantages of exhibiting all other Accusations against him, they do desire that he may be called to a speedy Answer, in the Presence of the Commons." Upon this, the Lord Mayor was brought to the Bar, as a Delinquent, kneeling upon his Knees, until he was wished to stand up. And then the Speaker told him, "he was impeached by the House of Commons of High Crimes and Misdemeanors." The Impeachment being read unto him, the Speaker desired his Answer; and he confessed he caused the said Proclamation to be published. Then he was commanded to withdraw; and being called in again, he was asked by the Speaker, whether he will justify and stand to this Answer or no. He answered, "That he desired to have Counsel to advise him in his Answer, and some Time to answer." Hereupon he withdrew. And this House Ordered, That the said Sir Richard Gurney, Knight and Baronet, shall have Counsel allowed him; and that he shall put in his Answer to this Impeachment in Person upon Friday Morning. "To our Honourable Friend Willm. Lenthall, Esquire, Speaker of the Honourable House of Commons. Present, these. That they have delivered the Orders to the House of Commons; and they will send an Answer, by Messengers of their own. That they have delivered the Letters to the House of Commons. "Instructions to be sent into Rutlandshire, to the Deputy Lieutenants of that County, for the Preservation of the same; videlicet, to Sir Edward Harrington, of Ridlington, Knight and Baronet, Mr. John Osborne, of Thorpe, Mr. Robt. Horseman, of Stretton, Mr. Eavers Armyn, of Retton, Sir Guy Palmes, the Lord Grey, Sir Arther Hasilrigg, and Sir Willm. Armyn. "Whereas it doth appear to the Lords and Commons now assembled in Parliament, that the King, seduced by wicked Counsels, intends to make War against his Parliament; and for that it is not improbable that, under Colour of raising a Guard for His Majesty's Person, or some other Pretence, the Knights, Gentlemen, Freeholders, and Inhabitants, of the County of Rutland, may be drawn together; therefore you, and every of you, shall take special Care, that the Ordinance concerning the Militia be forthwith put in Execution through the County, according to the Tenor of the said Ordinance; and the Sheriff, and all other Officers and Subjects, are hereby enjoined to assist you, and every of you, therein; and, if any Person whatsoever shall levy, or endeavour to levy, any Soldiers, or to draw or keep together the Trained Bands, or other armed Forces of the said County, or any other Forces, by Colour or Pretence of any Commission or Warrant from His Majesty, under the Great Seal or otherwise, without Order or Consent of both Houses of Parliament, you, and every of you, shall, in the Name and by the Authority of both the said Houses, require and command all Persons to forbear the Execution of such Commission or Warrant, and the same to be delivered up unto you, and every of you, to be sent to the Speaker of the House of Commons; and you, and every of you, Deputy Lieutenants, are hereby required to draw together such of the Trained Bands, and other Forces of the said County, as shall be expedient, for the suppressing of all such Assemblies, and for the apprehending of all or any Person or Persons as shall, after Admonition and Command by you, or any of you, made unto them, to forbear the Execution of any such Commission or Warrant, or the calling or gathering or keeping together of any such Forces or Assemblies, still persist in doing the same, as likewise such disaffected Persons as shall be found raising any Parties or Factions against the Parliament, to be sent up hither, to answer such their Offences, as to Law and Justice shall appertain. "And you, and every of you, shall, in the Name of the Lords and Commons, require and command the Sheriff of the County of Rutland to publish throughout the said County the Declarations formerly published by both Houses of Parliament. "You, and every of you, shall further take Care, that such Resolutions and Orders of both Houses as have been, or shall be, delivered or sent down unto you, or any of you, be put in Execution; and shall require the Sheriff, Justices of Peace, and all others His Majesty's Officers and Subjects, to be aiding and assisting unto you, and every of you, for that Purpose. 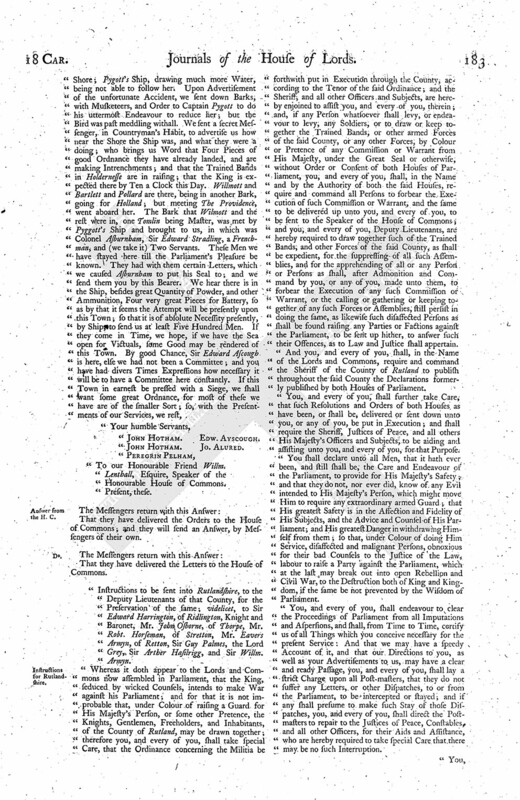 "You shall declare unto all Men, that it hath ever been, and still shall be, the Care and Endeavour of the Parliament, to provide for His Majesty's Safety; and that they do not, nor ever did, know of any Evil intended to His Majesty's Person, which might move Him to require any extraordinary armed Guard; that His greatest Safety is in the Affection and Fidelity of His Subjects, and the Advice and Counsel of His Parliament; and His greatest Danger in withdrawing Himself from them; so that, under Colour of doing Him Service, disaffected and malignant Persons, obnoxious for their bad Counsels to the Justice of the Law, labour to raise a Party against the Parliament, which at the last may break out into open Rebellion and Civil War, to the Destruction both of King and Kingdom, if the same be not prevented by the Wisdom of Parliament. "You, and every of you, shall endeavour to clear the Proceedings of Parliament from all Imputations and Aspersions, and shall, from Time to Time, certify us of all Things which you conceive necessary for the present Service: And that we may have a speedy Account of it, and that our Directions to you, as well as your Advertisements to us, may have a clear and ready Passage, you, and every of you, shall lay a strict Charge upon all Post-masters, that they do not suffer any Letters, or other Dispatches, to or from the Parliament, to be intercepted or stayed; and if any shall presume to make such Stay of those Dispatches, you, and every of you, shall direct the Postmasters to repair to the Justices of Peace, Constables, and all other Officers, for their Aids and Assistance, who are hereby required to take special Care that there may be no such Interruption. "You, and every of you, shall take Care that none of the Recusants Arms, or other Ammunition of the said County, shall be taken or carried out of the County, upon any Pretence or Command whatsoeever, without Warrant from both Houses of Parliament; and you, and every of you, shall give Order and Direction to the Sheriff, Justices of Peace, and other Officers, to require and command all the Popish Recusants in that County to confine themselves to their Dwellings, according to the Statute in that Case provided; and, if any such Recusant shall be found to transgress therein, you, and every of you, shall cause the Justices of the Peace forthwith to bind them to their good Behaviour, and, upon Refusal or Neglect to give Security accordingly, to commit them to Prison, and further to proceed against them according to the Law. "You shall also, in the Name of both Houses of Parliament, require all such Persons, who have in their Custody any Part of the Public Magazine of your said County, to deliver the same unto you, to be employed for the Defence of the said County. "And you, and every of you, are likewise to give Charge, from both Houses of Parliament, to all Captains, Lieutenants, and other Officers of the Militia, that they be observant to such Directions as they shall, from Time to Time, receive from the Lieutenant of the said County, or his Deputies, or any of them, for due Performance of any the Commands of the said Houses. "You, and every of you, shall resist and repel, and are hereby authorized to resist and repel, by the Power of the said County, and by all other Ways and Means, all such Force and Violence as shall be raised or brought to any Person or Persons, to the Hindrance or Disturbance of this present Service, or for the arresting or seizing of the Persons of you, or any of you, or of any other which shall be employed in the Performance of the Ordinances, Instructions, and Commands of both Houses of Parliament, for any Thing done in Execution thereof; and the Sheriff and Justices of Peace of the said County, and all other Officers and Subjects, are hereby enjoined to be aiding and assisting to you, and every of you, for the better and more speedy Execution of the Premises. Ordered, That Mr. Serjeant Rolls, Mr. Herne, Mr. Hales, and Mr. Chute, are assigned to be of Counsel with the Lord Mayor of London, in the Impeachment brought up against him from the House of Commons. Ordered, That the Cause of Mr. Green is referred to the Examination of the Earl of Bollingbrooke, Lord North, and Lord Hunsden, or any Two of them, to (fn. 3) meet when they please; and their Lordships are to make a Report of the State of the Cause to this House. Upon the Certificate of the Lord Dudley, "That Thomas Richards is Solicitor to his Lordship, and that he is arrested, and imprisoned in Stafford Gaol;" it is Ordered, That the said Richards shall be released from the said Imprisoment, and enjoy the Privilege of Parliament. The Earl of Northumberland reported to the House, "That he hath received a Letter from the Earl of Warwicke, signifying that the Five Captains that stood out are now come in; desiring that the Parliament would consider of some Course for the Indemnity of the Officers of the Navy." Ordered, That this be communicated to the House of Commons, to consider of Thanks to be given to the Earl Warwicke, and an Indemnity to the Officers. Sir Sam. Sleigh, May be Deputy Lieutenants in the County of Derby. Sir Robt. Craine to be Deputy Lieutenant for Suffolke. This Day Sevennight, for Hertfordshire. This Day Fortnight, for Derbyshire. Monday come Sevennight, for Cambridgeshire. This Day Sevennight, for Surrey. 3. To present a Letter, from the Earl of Warwicke, sent to Mr. Pym; and they desire their Lordships to join with them, that it may be printed and published. 4. The Letter sealed up was brought up; and, because it was the King's, the House of Commons would by no Means open it; but think it fit that it be sent to His Majesty, by Directions from both Houses. 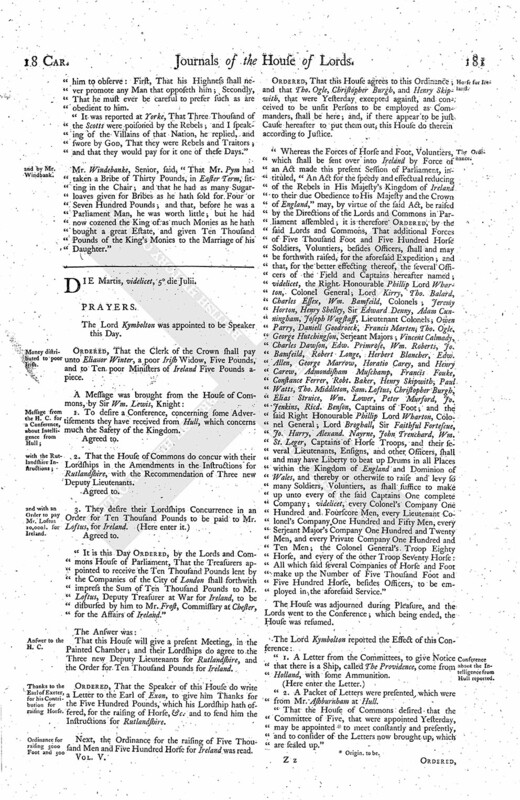 The Order was brought up, sent to the House of Commons this Morning, with an Alteration, concerning the Lieutenants and Deputy Lieutenants of several Counties to aid one another; and the House of Commons have made another Alteration in it, to which they desire their Lordships Concurrence. That their Lordships do agree to the Deputy Lieutenants brought up now; and do agree to print the Earl of Warwicke's Letter, and for sending the King's Letter to Him. As for the other Two Particulars, this House will (fn. 4) send an Answer, by Messengers of their own. "Your Letter of the 4th of July hath been read in the Lords House, and by them communicated, at a Conference, to the House of Commons: The Lords have commanded me to let your Lordship know, that the Resolution you have taken to obey the Ordinance of both Houses, in continuing the Command of the Fleet, and your Carriage upon the Receipt of that Ordinance, in the Obedience, Affection, and Courage expressed by the Captains, Masters, and Sailors under you, hath given great Satisfaction and Contentment to both Houses; for which I am commanded, in their Names, to give your Lordship Thanks, and to desire you, from them, to do the like to those Officers and Sailors, who manifested so much Fidelity and Resolution in that Service; assuring your Lordship, as you may them, that there shall be nothing necessary for [ (fn. 5) their Indemnity], which both Houses, to their utmost Power, will not be ready to afford you; and this they desire may encourage your Lordship and the rest to go on chearfully in this great Charge committed to your Trust, (fn. 6) which so much concerns the Safety of His Majesty's Person and the Peace and Welfare of the Kingdom." Ordered, That this House approves of this Letter; and that it be signed by the Speaker of this House. Ordered, That the Lord Cromewell hath Leave to go into Ireland, to his Charge there, and hath Leave to go to Yorke, about some Business there. To desire that, at this next Conference, the House of Commons may impart to their Lordships some Letters, which they have received from Hull; and also that they may impart to their Lordships some Propositions concerning the Safety of the Kingdom. The Answer was returned accordingly. 5. Origin. Indemnity and their.